2009 has been very kind to me. So I would like to bid it farewell with 'ae fond kiss'. I would also like to take this opportunity to wish my readers, followers and those of you that have come by my blog, many, many Happy New Years. This year, although I have been extremely good and committed to eating local, fresh produce or British grown. There are some seasonal products that are not grown here, so have to be imported, such as the cranberry, which you may know, I have been thoroughly enjoying. So for next year, on my gardening 'wish list' is to get myself a cranberry bush, here’s hoping. Anyway, as I still had some imported cranberries sitting at the bottom of my fridge, a couple of days ago, I decided to make Cranberry bread. I got the original recipe from Freds blog Grown Away. Fred informed me that his home state was one of largest cranberry producers, so he was merrily looking forward to receiving some black heirloom cranberries in his vegetable box, but surprisingly none appeared. 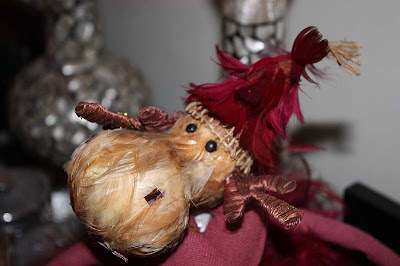 Although disappointed, Fred was not deterred and purchased some dried local cranberries from his natural food store; and made an incredibly simple cranberry walnut bead. Now I have absolutely no doubt that Fred's Cranberry and walnut bread was delicious, but you know me, I had to tweak it just a little. Sorry Fred, (she says wincing) but I think you will approve. I don’t think the photograph taken does the 'Cranberry and Clementine bread' justice, as it doesn’t show the burst colours of the cranberries, but they are there. The bread was moist, it was not as sweet as the scones and the muffins I made earlier in the month. I think because they had white chocolate in them, whereas this bread allowed the sourness of the cranberries to come through, which my husband loved. The flavour of the Clementine also came through, although a tad subtle and the walnuts gave it that extra texture. Nice. Now talking of growing and cakes, I thought I better mention that I have been fortunate to have been chosen to receive not one, but two gifts from fellow bloggers. The first is a baking book called Muffins Galore from Icook4fun of Kitchen Snippets. I had completely forgotten about this until I got an email yesterday. The second will be a surprise gift from Ribbit of The Corner Yard where I will become one of the lucky recipients of a 'Pay it Forward' parcel. 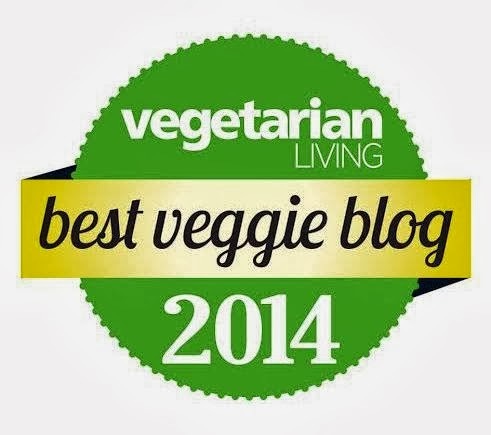 Please do check out this link, I absolutely adore the way my 'blogger name' was picked out! 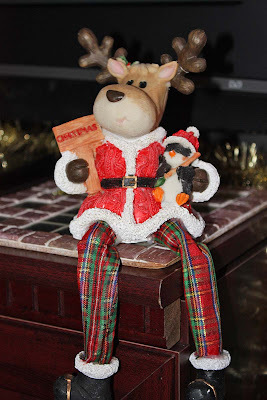 What a lovely way to end the year…unexpected gifts, Smiles and new blog friends. And finally, how could we forget about the little birds that entertain us in the garden, I made them a loaf of there own too. 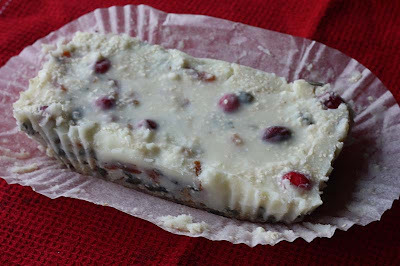 I made this with vegetable fat which I melted, ands then poured into a 2lb loaf tin that contained a mixture of chopped apples, nuts, seeds, dried fruit and some fresh cranberries. I left it in the fridge overnight and then the following day, cut a slice and left it on the Bird table. Sorry I didn't get a picture of that, I wanted to - but the red breasted Robin just wouldn't pose for me. In a bowl, combine flour, sugar, baking powder, salt and soda. Cut in butter until mixture resembles coarse crumbs. Beat egg, juice and peel; stir into dry ingredients just until blended. Add the cranberries and walnuts. Spoon batter into a greased 2lb loaf pan. Bake at Gas mark 4 for 45 minutes to an hour or until a toothpick inserted near the centre comes out clean. Cool in pan 10 minutes before removing to a wire rack to cool completely. I took Fred’s advice and cooked the bread on a lower temperature. I loved the simplicity of this recipe, plus the use of American cup measurements. *The only part that made me raise my eyebrows was measuring butter in the quarter cup, you have to push in the butter and then spoon it out to use. I am always filled with anger and disappointment when I read or hear of cultural insensitivities or worse, people’s basic lack of common sense, to treat each other with some dignity and respect. In the past I have wrote about how my soup was not 'suitable for vegetarians'; and my marshmallow experience. Well yesterday I saw this article on my blog sidebar. At this works buffet, 'Scotch eggs' were labelled as an option 'suitable for vegetarians' and suitable to consume by those of a particular religious background, in this case Muslim employees. In actual fact, these 'Scotch eggs' were not suitable as they were made from pork. I would personally have terminated the contract of the caterers, but no apparently this organisation offers the offended employees who had eaten the meat product, a cup of tea. The sceptic in me would not surprised if this was done out of malice; or for a joke by one of the caterers staff members. I mean anyone who has been raised in the U.K or gone to any traditional British buffet will know that the 'Scotch egg' is a hard boiled egg covered in sausage meat made namely from pork, then coated with breadcrumbs and deep-fried. 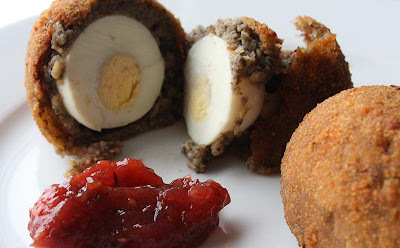 Scotch eggs can be eaten hot or cold and are often served at parties, cold buffets and picnics, similar to the pork pie. Therefore not suitable for people with particular diets. I remember at Primary school witnessing and experiencing bullying behaviours from other children, specifically towards Arabic or South Asian children like myself, and in particular those who were Muslim, easily identified by dress. Other than the racist jibes that were deemed normal part of growing up for children of colour in this part of Wales, the other jibes you would often hear would be ‘do you wanna pork pie’. This wasn't a question, it was deemed an insult aimed primarily at the Muslim children who religiously were forbidden to eat any part of the pig. At night, the cowardly racist adults would throw bits of pork pies at the windows of Muslim homes, and at the small Jewish community, it would be eggs. I don’t think this kind of behaviour has disappeared, in those days it was direct, nowadays it is subtle. Anyway, back to the above article/incident – I also do think the Muslim employees should have used their personal judgement and commonsense too, as sometimes the offering of complimentary food tempts us to overlook our dietary convictions, sometimes it easy to blame others afterwards, rather than take personal responsibility at the time. Personally, I have liked the ‘idea’ of the Scotch egg. 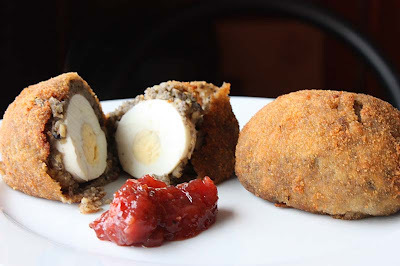 I have always liked crispy things, and admired the deep fried coating of the scotch egg. 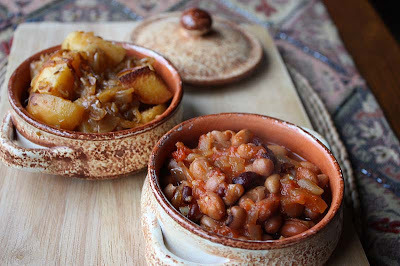 I had always wanted to make a vegetarian version and had read numerous ways to do this, with nuts, beans and pulses, but I wanted to include a vegetable, a fungi in this case. So here is my take. This was originally a Pâté , as I had made too much (double the quantity), I decided I could use the remaining Pâté to mould a hard boiled egg, coat with breadcrumbs and deep fry and there you have it my vegetarian 'scotch egg'. Place lentils and bay leaf into a pan and cover with cold water. Cover pan and simmer for 40 minutes or until lentils are soft. Drain well. Melt the butter in a pan over low heat. Add onion and cook for a couple of minutes, then add mushroom, oregano, lemon juice and seasoning. Cover and cook on a low heat until mushrooms are soft. Combine well drained lentils and mushrooms mixture into a food processor and blend til the mixture is relatively smooth, be careful not to puree it. Allow to cool. Divide the mixture into six, then take a handful and pat it in your palm, gently covering the hard boiled eggs completely. Leave in fridge for up to an hour to firm up. 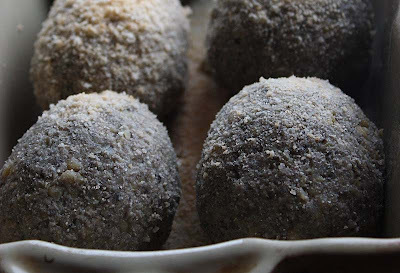 When ready to eat, bring back to room temperature (don't miss this step or the coating will split whilst deep frying) before dipping in beaten egg, coat in breadcrumbs and deep fry till golden. I served these with beetroot chutney and home-made piccalilli. Now why didn’t the caterers think of this?! I had the opportunity to make some more cranberry and white chocolate chip scones this morning. These I decided to make in the same vain as my lavender scones and used my heart shaped cookie cutter. The only thing I did different with these was I studded some of the scones with the fresh cranberries cut in half and some white chocolate chips. By the way, I am not done with cranberries yet, I also have a 'cranberry and clementine loaf' in the oven (ooh the flat smells like a bakery), but I'll show slices of that to you later on in the week. Now I know I wrote a little about my Christmas past, I hope I wasn't misleading anyone by suggesting that D and me don't give each other gifts on Christmas day, actually we do. We enjoy like the next person, giving and receiving, so below are a few things that my dear husband gave to me with a loving kiss. Books that I have been eyeing for a while. Other than The Gourmet Gardener which is a growers book, the others are all cookbooks from reputable vegetarian eateries: Cornucopia in Dublin; Demuths in Bath and Terre à Terre in Brighton. I appreciate them all, but I am mostly excited by Terre à Terre as this book has so many inventive recipes including vegetarian marshmallows and each dish is presented beautifully. The recipes in this long anticipated cookbook also show that vegetarians and vegans are gourmands too, something that often gets overlooked. As I have been making the most of my cookie cutters of late, D got me some more in fruit and vegetable shapes. They are so dainty. And finally, contrary to all the sweet things that appear on my blog, I don't really have a 'sweet tooth'. 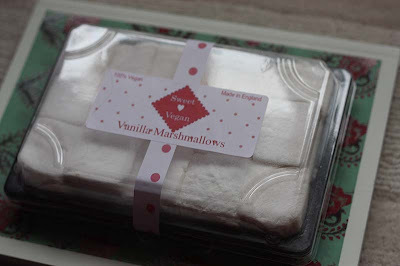 I am more of a savoury kinda girl, so instead of getting me a box of chocolates this year, D decided to get me some vegan marshmallows made in England, U.K. I'll let you know how they taste when I open the package, which won't be that long as the expiry date is only next month. Or what is known in my home as 'hedgehog' roasted potatoes, even though they look nothing like the spiny, nocturnal mammal. And even better, no animals were harmed in the making of this dish. Today, I wanted a lazy cooking day, so opted to make some fancy jacket potatoes, known as hasselbacks. Hasselbacks are perhaps the best-known of all Swedish potato recipes. The potatoes are sliced almost to the base, so the slices open out like a delicate fan when cooked. To my knowledge, the traditional hasselback recipe uses bay leafs and butter, but in this recipe I decided to use some of the fresh rosemary growing in my garden plot, olive oil and sea salt. I baked these in the oven at Gas mark 5 for about an hour until the edges had become golden and crisp. I just had to accompany the hasselback potato with my 'Moose' Christmas ornament, there is just something complimentary about it. I hope your all enjoying your holidays, I have tomorrow off, then I am back in work on Tuesday, so am trying to make the most of my time just lazing about. I try not to eat tofu as a meat replacement, but as an ingredient of its own. Although I have tried the silken tofu a couple of times, my preference really is to use the firmer tofu for dishes such as Tofu and Mushroom strogonoff, Thai Green Vegetable curry or even Red curry. However, the one major problem with tofu is that it is often waterlogged, making it not particularly pleasant to eat. I made these tofu crisps a couple of days ago and anyone who has deep fried tofu will know that it is extremely watery, and we all know that water and oil do not mix. So getting rid of the water from the tofu in my home involves pressing the tofu with a 'cast iron' literally, which can be a hassle resulting in puddles of murky water. 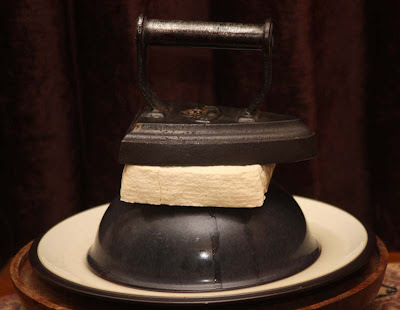 In the past I used to use plates and weights of tinned tomatoes and beans, but then came across this cast iron at an antiques fair and thought to myself 'ahh that it would be a handy kitchen gadget' for pressing all kinds of foods, not just tofu. 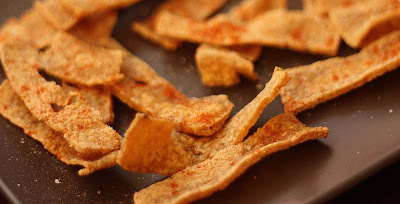 I need a Tofu Press gadget, then making dishes like these Tofu crisps won't feel so dangerous. All that spluttering, made me nervous and I am quite comfortable cooking with hot oil! After I had shallow fried these think tofu strips I sprinkled over some salt and paprika. My husband took a bite of one and then decided I could enjoy the rest on my own. I think they were okay. 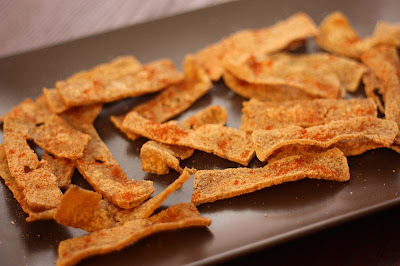 In fact, if I am honest, I don't think I would make these tofu crisps again. I would rather eat the tofu spicy biltong instead, for me they had more flavour. Forgive me dear readers, but I still seem to be riding on this culinary 'Cranberry roller coaster'. After making the cranbelly Robin biscuits last week; and the Cranberry and white chocolate chip muffins early this month, today I thought I try my hand at making some fresh cranberry and white chocolate chip scones. Well I must say I am so glad I did, they turned out pretty good. These scones were really, really light. They were not overly sweet either and the sharpness of the freshly burst cranberry juice in the scones were quite delightful on the tongue. Yum yum. If you don't believe me, try them - you might just like. I tried to convert the measurements for these scones into American cups, but I don't know how successful I was. But I am trying hey. Sift the flour, sugar, baking powder, baking soda and salt together. Add in the margarine or butter till mixture and working with your fingers blend so it begins to resemble breadcrumbs, then stir in the cranberries and white chocolate chips. Carefully add some of the milk and mix to make a smooth dough. Then on a lightly floured surface. Roll out to about 2 inch thick and either cut into individual scones using a cookie cutter; or cut into wedges. Bake at gas mark 4 for 20-25 minutes. We went over to the allotment yesterday afternoon. Although there were plenty of footprints about, including those of four legged beasties, there wasn't anyone else there. We had difficulty getting into our plot, as the padlocks were iced over, so D had to jump over the gate. 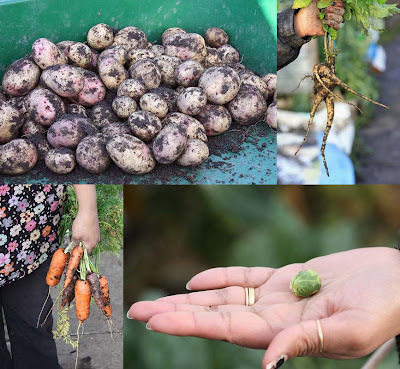 Unfortunately we will not be having our home-grown parsnips on the plate, as we couldn't see them for the snow, and even if we had removed the snow, the ground is so hard, that we would not have been able to pull them out in one piece. D started picking the sprouts of the plant one by one, but that would have been so time-consuming, plus his fingers were getting pretty cold with the ice, so he snapped the best looking Brussels sprouts plant to bring home. Anyway, I must go - but before I do - I would like to wish Each and Everyone of you a Happy Christmas and Happy Eating with Friends, families and loved ones! 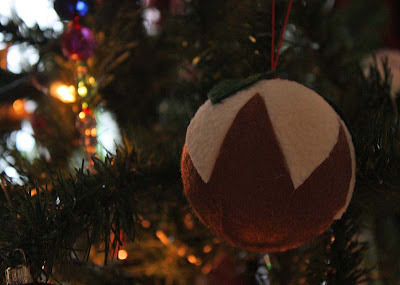 I grew up celebrating Christmas on a small scale. Christmas wasn’t about the pressure of buying each other presents – the closest it got was: a present for a Teacher; or exchange of Christmas cards at primary school level; and at High school, perhaps a box of chocolates between close friends. In our home, Christmas was celebrated in one room, the living room. In this room, my mother would make the effort of hanging some mainstream decorations (that could be re-used for other celebrations, my mother was forward thinking you see). 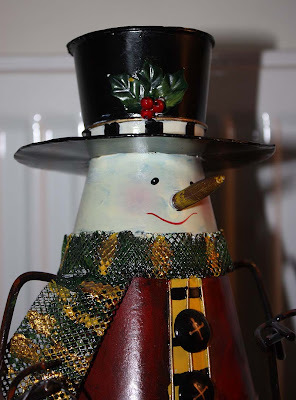 We never had a Christmas tree dangling with baubles, or beneath it, parcels wrapped up in gold and red glitzy paper, no crackers, or festive nick nacks, but the mantelpiece was adorned with Christmas card we had recieved or those glittery ones we had made at school. Throughout the season, we were firmly reminded by our parents that Christmas was about Jesus Christ, time for family – not just presents. So when Christmas day finally arrived, we celebrated like any family would. We dressed up in our shimmery brand new outfits, lovingly handmade by my mother. I was even allowed to put on a little rouge on my cheeks and lips. We all sat down as a family to eat something special. In our case it was a fat, juicy tandoori chicken; and some spiced fish, why was it special? Well my father made the family meal on Christmas day, giving a break to my mother. He also made his Anglo-Indian style roast potatoes with shorba (gravy). We adored this as it was something different from our usual fare, and it was quite funny to see our Dad in the kitchen. My contribution at the time would be to make the trifle with its hundreds and thousands from a packet. After stuffing ourselves on really good food, it was all about 'quality and rabble' time together, playing games, watching cartoons, films like Spielberg E.T. and Chitty chitty bang bang and gorge on more trifle . 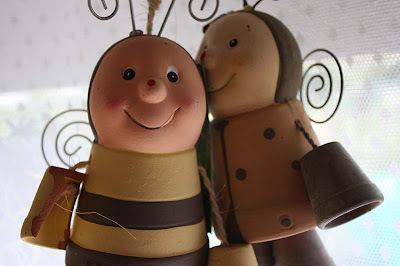 There was no exchange of presents between us, but my father would give us some money up to £5.00 each (depending on age), this pacified us, all those sweets we could buy. It was all good. From not really celebrating Christmas on a mainstream scale in my childhood, my adulthood saw a change, particularly when I left home for University and external influences started rubbing on me. I hate to admit it, but it was around this time that I actually went though a greedy and selfish phase, where my expectations of receiving a Christmas present were really high, and this was from people who were not even family, I cannot believe I behaved like that in my early adulthood, but must admit I reflected and learned from that personal experience. Now I am more than content with a home-made preserves, jams, chutneys and even bottles of home made liqueurs, but in the past I would have certainly snugged my nose. The last few years saw me celebrate Christmas with my future-in-laws in Essex, (but that has not happened for a couple of years as D’s parents have moved overseas to sunnier climates). Also my nephews whom I am very close to were getting to an age, where they could come and spend time with me, so it became a bit of a tradition, that after spending Christmas with D’s parents, two or three days later we would swerve via Wales and pick them up on our drive back up to Scotland; or failing that they would fly up. This year however, the oldest nephew has just secured himself a job in the hotelier business, and with Christmas and the New Year being the industry’s peak season he will not be getting time off; and understandably, the youngest did not want to come without his brother. So the pressure many people feel in order to get presents and ‘spend, spend, spend’ has not been on us this year. This year, there will be just D and me – looking at each other. I thank my lucky stars that at least we have each other to share Christmas day. Happy Christmas to you all – wherever you are. For those of you who are still thinking what to have on the plate either for yourself as a vegetarian or vegan; or to serve your vegetarian or vegan guests. Well how about a Mushroom en Croûte?! It hardly takes any time to put together, especially as all the ingredients can be bought ready made. This is such a simple idea that I kick myself as to why I had not thought of it. You don’t even have to use tapenade you could use a pâté, pesto or even caramelised onions in its place. I think this recipe is extremely versatile. Check the label if you are using a shop bought tapenade as some do contain anchovies; or make your own, providing you have a food processor, below is a straightforward vegan tapenade recipe. Also, I recently learned the many shop bought puff pastry’s are suitable for vegans as they are made with vegetable oil. With my vegan readers in mind, naughtily from work I even rang the Vegetarian Society this morning to confirm that this was indeed the case. The woman on the other end of the phone told me that she was vegan and loved this product. She confirmed that the majority of this brands products were suitable for vegan. However, do check the labelling as some are ‘all butter’. Good news for vegans in the U.K, eh!? Sit the mushrooms stem side up, cut off the stem and make crisscross cuts all over, being careful not to cut through the base of the mushroom. Distribute the garlic evenly over the base of the mushrooms along with seasoning, then spread tablespoon of tapenade on each mushroom base. Spread out the pastry on a floured board and roll it out so that you can have four squares. Put the mushroom stem side up into the centre of each pastry square and fold the sides up to encase it, pinching gently with your fingertips. 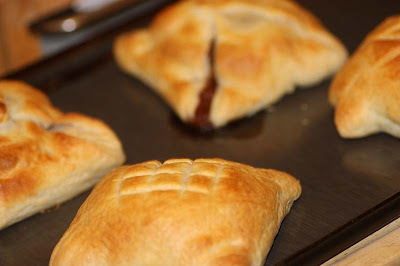 Put the mushroom parcels on to a baking sheet, whichever side up you wish. Brush with the milk. 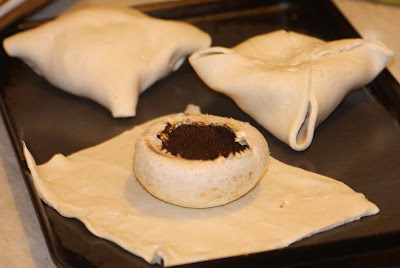 Bake in a preheated oven, gas mark 6 for 25 minutes or until the pastry is puffed up and golden brown and the mushrooms are tender Adapted from Rose Elliot's Veggie Chic. Blitz all ingredients for a few seconds, being careful not to over-do it, since tapenade should have some texture. If you don't have a food processor, finely mince the olives and garlic, then combine with all the other ingredients, mixing well. I came across an article in the Guardian last week by Adharanand Finn. Towards the end he posed the question ‘If you're making a meat-free main course this year, what will it be?’ I didn't dwell on it too much, as it is just the two of us this Christmas, yet it still got me thinking about past Christmases spent with family and friends. My husband is not a vegetarian, but like me he is quite content with all the trimmings, as portions are always generous this time of year. But family and friends around us think our meal is not complete without a piece of meat on the plate, even it if is a 'mock meat' substitute. So over the years when we have gone to D’s parents for Christmas we have had the meat replaced with slices of this, which I can take or leave. I personally would be happy with a traditional nut roast, but it is hard to get a good shop bought one, so tend to make versions of my own. Often the carnivores and omnivores in my life, and I am referring here specifically to my brothers will try a little, then snug their noses ‘it’s okay’ but they could never be a vegetarian, they 'love their meat way too much…’, this is something that Ardharanand also wrote about. In the past I have also made variations of The Vegetarian Society’s cranberry raised pie, Rose Elliot's Flaky Mushroom Christmas Tree and Nadine Abensur’s fabulous Mushroom Wellington and thoroughly enjoyed them all, but that’s me, my husband is not keen on nuts roasts and thinks of them as an equivalent to a stuffing, so opts for the above meat substitute; or failing that he picks up a few slices of turkey from the Deli for his plate. So what will be on my plate this Christmas, (hopefully) there will be home-grown roasted parsnips (If I can prize them out of the icy ground); Sprouts (tiny bullets they may be); Roasted potatoes (stored in the shed in a jute bag) and carrots (about a dozen covered in sand, saved for specifically for Christmas. Fingers crossed they haven't gone mouldy). As well as home-made Yorkshire puddings, stuffing and a shop-bought Vegetarian gravy, which even my mother-in-law approves of. To be truthful, Christmas for me it isn’t about the food or the presents, its about sharing and enjoying time together. Anyway, I now ask you the same question ‘will you be cooking a vegetarian Christmas dinner, either for yourself or some guests? And are you going for the traditional nut roast, Tofurky or something completely different?’ Let me know. I have to admit I have never made Christmas biscuits before, but recently the little home cook in me thought why not after all it is the festive season. 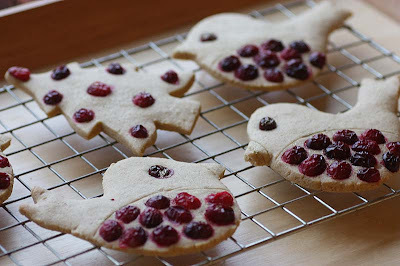 So I decided upon making some 'robin biscuits' with the ingredient of the moment, the seasonal cranberry. Cranberries are deep crimson in colour and are related to the blueberry, but unlike its cousin the cranberry is quite a tart and sharp tasting berry, so it is not to everyones taste. Cranberries have always been valued, but it only over the past ten years, the cranberry has gained worldwide popularity, particularly for its juice. There are a number of health claims which suggest that it can help to prevent urinary-tract infections, gum disease and stomach ulcers, and may even help to protect against heart disease and cancer. Unlike other berries such as the strawberry and raspberry, the cranberry is quite robust and can last in the fridge for at least two weeks. 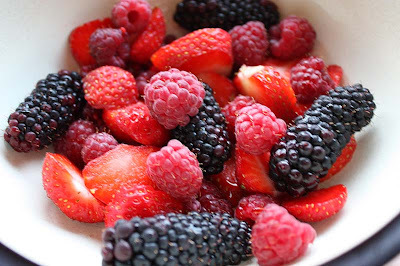 The reason it is long lasting is because the berries contain large amounts of benzoic acid, a natural preservative. As cranberries are a seasonal berry and only available during the winter season, I would recommend to anyone to freeze some as they will keep up to nine months. Then they can be used directly in recipes without thawing. 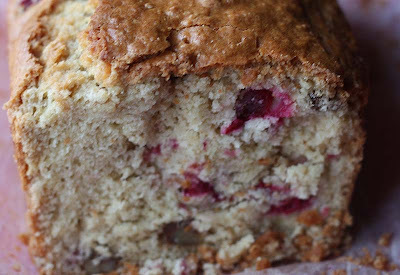 Cranberries make delicious muffins. Now back to my biscuits, although I have a lot of biscuit and cookie cutters, including Christmassy themes ones, I did not have a robin one, so in the style of a 'Blue Peter' child I made a template of rocking robin from an old Christmas card, cut it out and then used it to carefully to cut around the rolled out dough. I know these are not the most professional looking of Christmas biscuits, but as a home cook I am pretty chuffed with them. 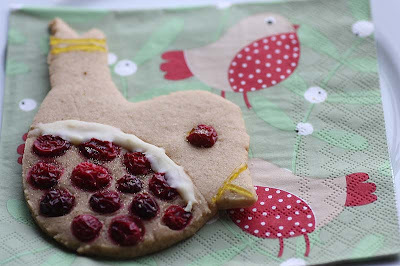 In the future, I think I would stud the belly of the robin with a mix of white chocolate chips and chips; or even coat the whole robin biscuit all in dark chocolate and then stud the belly with cranberries. As you can see below I originally submitted this recipe to the Weekend Herb Blogging event, but I have been encouraged by Nicisme of Cherrapeno who is hosting the December Sugar High Friday (an event created by Jennifer of The Domestic Goddess) to submit it as the theme of Holiday Sweet Treats. 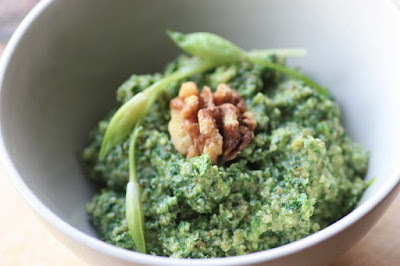 I am submitting this recipe to the lovely Haalo who is hosting this weeks Weekend Herb Blogging#214. WHB is a weekly food blog event showcases information and recipes about herbs, vegetables, fruits and other plant ingredients. WHB was initiated 4 years ago by Kalyn's Kitchen, it is now organized by Haalo of Cook (Almost) Anything At Least Once. Please note that Weekend Herb Blogging will be taking a break for Christmas and the New Year and will resume on January 4th 2010 when Haalo will be hosting again. Finally, please remember to feed and water the 'real' birds over the winter season. 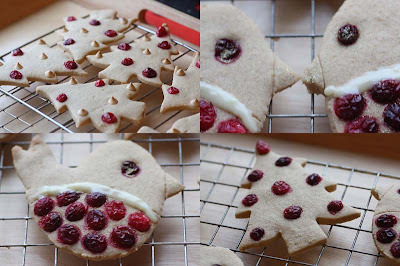 Find a reliable biscuit recipe and make according to instructions, use a robin biscuit/cookie cutter and cut out required number. 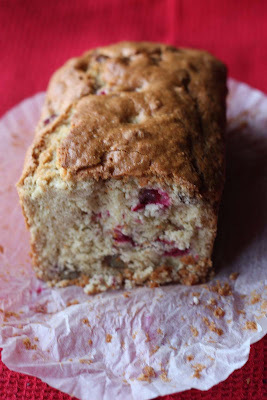 Then stud the eye and belly with fresh cranberries that have been cut in half and bake according to recipe instructions. I've been working the early shift all week, so had the opportunity to stop by the allotment early in the week, when I had picked some silverline chard. I had completely forgotten about it, until I went to the fridge earlier and saw it there wilting. So I decided to make the most of it and transform it into a soup. It was most welcome as it had just began to snow, not the soft fluffy stuff - but the blustery stuff that melted as soon as it touched the ground. This chard soup was made pretty much to taste and eye, so no measuring scales or cups. I noted upon cooking and blitzing the chard, the flavour had completely changed. I actually found it more flavoursome this way, its earthiness came through more. 6 large chard stalks, mix of white and green. Chop the stalks and roughly mince the leaves. In a large pot, add the onion and garlic and cook over moderate heat until soft and translucent. Add the chopped stalks of the chard and cook for about five minutes before adding the stock, bring to a boil, then turn the heat down and cook for 15 minutes, then add the leaves and cannellini beans cook for a further 10 minutes. Turn off. When cool. Blend half of the soup. Gently reheat and taste for seasoning. This is really a healthier and succulent version of Bombay potatoes, that really do melt in your mouth. I made these with my own homegrown onions. 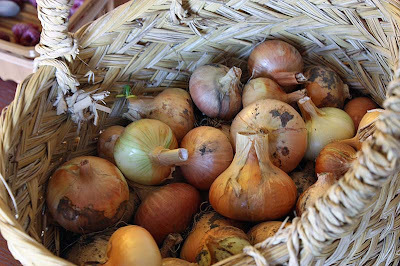 My onions this year have been disappointing compared to the previous year, as they were much smaller. Yet I am pleased in the knowledge that they are mine and can still make me cry (when I am peeling them of course). 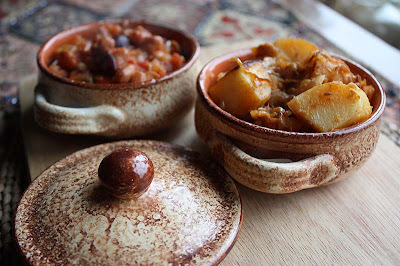 I served the spiced onion and potato roast with a vegetarian chilli bean. Most people have a good vegetarian chilli bean recipe up their sleeve, so I am not posting one. 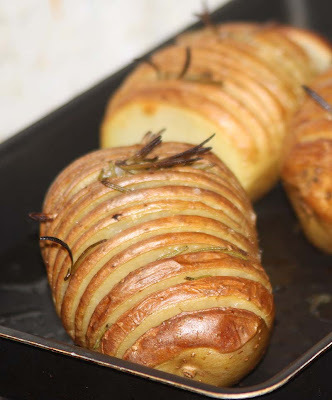 Just make your own and enjoy it with this potato and onion roast, a change from the usual plain rice or tortillas wraps. Heat oil in a casserole dish and cook the onion and spices until soft and the flavours are well infused. Add garlic and potatoes to the casserole dish and coat well in spicy onion mixture. Then place casserole dish in oven gas mark 6 for 45 minutes to an hour until cooked through. Adapted from Entertaining with Friends by Simon Hope. The carnivorous amongst you would have meat and two veg on your plates. For me its usually a good plate of diverse vegetables, but when the winter season truly kicks in, the colourful vegetables that adorned my plate early in the year are drastically reduced. So I end up filling this gap on my plate with an 'accompaniment'. This could be vegetarian sausages, a supermarket mock ‘meat’ product, or a home made ones such as a lentil-nut-vegetable loaves, which I prefer. I know many people, vegetarians too would turn their nose up to the option of a nut loaf and would rather to leave it in the deep realms of the 1960s, but I think a good nut or lentil loaf deserves its place in today's society. So I am putting the limelight on this 3 lentil vegetable loaf. 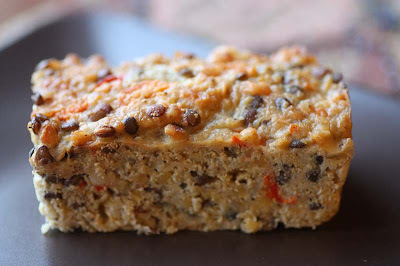 This lentil vegetable loaf was really substantial and quite tasty too. I have served it with both gravy and chutney, and eaten it both warm and cold. 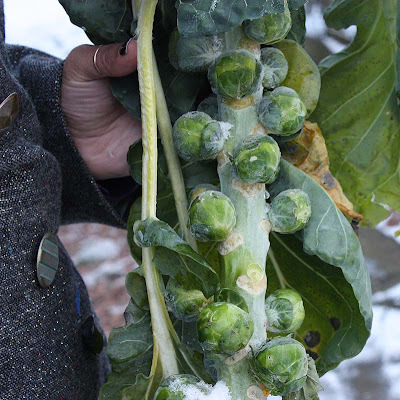 Although the vegetables at my plot are scarce with only brassica’s such as cavolo nero; and Brussels sprouts greening my dinner plate. It's not all bad really, as I still have plenty of chard, some beetroot and parsnips in the ground. In storage, we have potatoes, some carrots; and in the freezer: peas, green beans and plenty of berries. Line the base of the loaf tin(s) with baking parchment paper. Place all the lentils (and peas if using) in different pots covered with water and cook until cooked, about 10 minutes for the orange lentils and 15 minutes for the puy and brown lentils. Drain and place all of them in a large mixing bowl. Melt the butter in a large saucepan and add all the vegetables, garlic, chilli and cumin. Cook over a low heat, until the vegetables are just tender. Remove from the heat and add to the lentils with the ground nuts, cheese, and eggs. Mix thoroughly, then season well and taste. 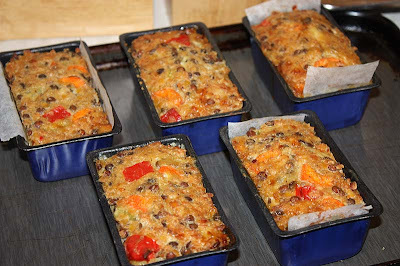 Spoon the mixture into the lined loaf tin(s) and bake in a preheated oven gas mark 3 for 45 minutes, until firm to the touch. Allow to cool before serving. 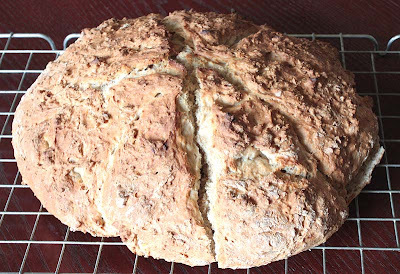 Adapted from an Irish cookbook called Avoca Café Cookbook. I know some people in the U.K are fortunate enough to be growing their own cranberries, but to my knowledge they are not yet grown or sold on a commercial basis here, so often I like many people tend to buy those imported from the USA. However, if I should ever come across a cranberry bush at a garden centre here, I would certainly have a go at trying to grow my own, as I think they would be very similar to blueberries. The only thing I am unsure about is whether they would require more than one plant for cross pollination; or if the one plant be fine. I am not concerned about how much I would be able to harvest, just as long as I get enough for the Christmas season. Anyway, like many homes, the cranberry only comes into my kitchen during the month of December. Instead of a rich, dark Christmas pudding, I tend to make Nigella’s Cranberry pudding and undoubtedly that is what I will be making for Christmas day, but today whilst I am still working I thought I would have a go at making some cranberry muffins for the rest of my working week. I was really pleased with them and they look so seasonal. 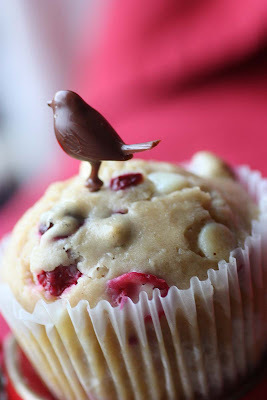 These muffins are quite flavourful, and the sharpness of the cranberry balanced really well with the sweetness of the white chocolate. Oh just thought I would share a quirky fact with you about cranberries, if they are fresh and ripe they will bounce, whereas those damaged will not. I thought it was interesting...especially when a number of them literally bounced on the ground when I attempted to chop them. Updated on the 18th December - I have been encouraged to enter the above image into this months NCR competition, so like a good little girl I am obeying instructions and submitting the above image to this months host Jacqueline of Tinned Tomatoes. The challenge is to submit a festive photo, it doesn't have to involve food, just something that captures the mood of the festive season. 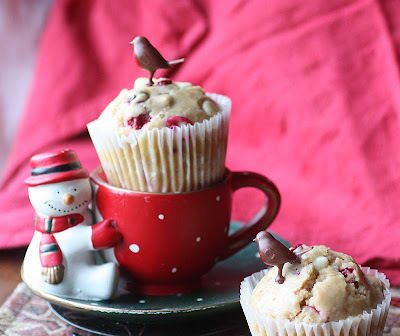 Well I guess my snowman holding a seasonal cranberry muffin with specks of snowflake chocolate should be shared, especially if it brings a smile to make fellow bloggers faces. Regular readers will note that I have used American measurement this time. I often do when I make muffins, it only seems right. 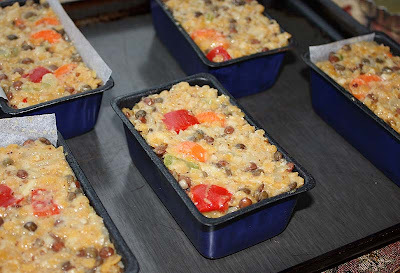 Line a 12 hole muffin tin with casings. Preheat the oven to gas mark 5. In a bowl, gently stir together flour, brown sugar, salt and baking powder. In another bowl, gently beat in eggs, milk, and the melted butter. Then add the wet ingredients to the dry mixture, along with the chocolate chips and cranberries, and stir to combine well. Fill the muffin cases and bake for 20 – 25 minutes or until golden brown. Cool on w wire rack before enjoying. 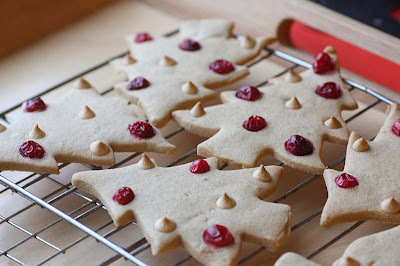 Adapted from ‘Tis the Season by Nanette Blanchard who was inspired by a cranberry and chocolate cookie recipe, now that something I want to try too. Cranks was one of the first vegetarian restaurants that appeared in Britain. It opened its first restaurant in 1961 in the famous Carnaby Street and soon earned its reputation as the place to eat for vegetarians. But by the 1980s and 90s, the stereotypical image of the vegetarian as sandal-wearing-lentil-loving-hippy was apparently holding the restaurant back, so the chain had to transform the way people saw vegetarian cuisine and 'vegetarians'. The chain also faced competition with the increasing availability of vegetarian food, not just by other vegetarian outlets, but by mainstream supermarkets too. I have never eaten at Cranks (as all the restaurants were located in England), but have most - if not all of the cookbooks. I liked the Cranks traditional image of hand-thrown pottery and heavy wooden chairs presented beautifully through some of their books, something that modern day restaurants try to accomplish with new furniture and decor. But unfortunately, after years of serving wholesome, flavourful and hearty dishes, Cranks closed all its outlets in January 2001. I think there is now only one restaurant, in Dartington, Devon. If I should ever venture that way, I will be paying them a visit as it is a vegetarian culinary British institution. Anyway, after that history lesson on Cranks I guess I should let you know what a Homity pie is?! Homity pies were one of the most popular dishes served at Cranks. I would describe homity pies as an open shell pastry with a potato filling. I have read two different stories about the origins of the homity pie. One states it was an old English economy meal recipe from the Second World War, the other says it was a Romany speciality. To keep up with the changing times, the homity pie had also gone through a number of transformations at Cranks: the potatoes were mashed and made without the pastry case; or flavoured with Tamari and Tabasco. Well yesterday afternoon I had decided to make some Cranks style homity pies. It is a little time consuming as you have to make the wholemeal pastry, rest it in the fridge, blind bake it and then it’s onto the potato filling - that is why I decided to make it the day before. 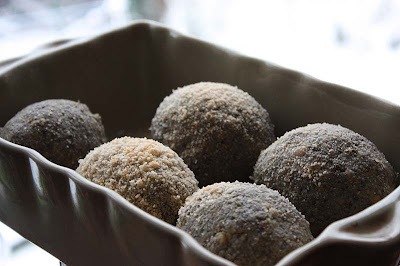 My recipe is based on Nadine Abensur's 'traditional' Cranks recipe that was brought into the 1990s, but I have added a small pinch of spice to take it a little bit further. My sincere apologies to those who adore the 'real traditional Cranks pie', but do give this a go - you may just like it. Sift the flour and salt into a bowl, folding the bran back in. Rub the butter into it and add the water. Once you have brought the dough into a ball, wrap it loosely in cling film and leave it in the fridge for 30 minutes. Boil the potatoes until tender then drain and set aside. Fry the onions and garlic until tender and translucent. Add the mushrooms, chilli or cayenne pepper and cook for five minutes, then add the potatoes and cook for a couple of minutes. Finally add the double cream, then remove from the heat and add half the cheese. 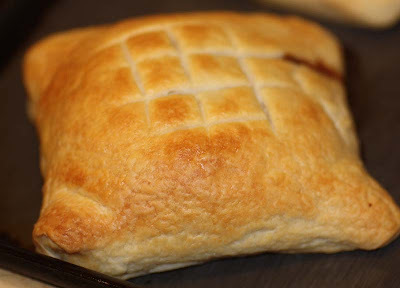 Season with salt and pepper and cayenne pepper if using, add the coriander and allow to cool before spooning generously into pastry cases. 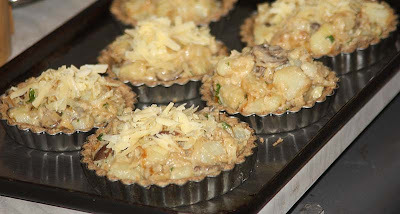 Scatter the remaining cheese generously all over and bake for about 20 minutes in the oven. These can be eaten warm or at room temperature. Adapted from the Cranks Bible. Finally, to end, this morning I learned that the homity pies are making a comeback and are now being sold at selected Waitrose stores, but why would you want to buy them when you can so easily make them at home, ah I guess there are times when you don’t get round to making your own. Yes, if you are referring to spring onions and the red chilli pepper which are two ingredients I used to make some tarka mung (moong) bean dal. Tarka is simply a seasoned and flavoured oil. It is a technique used in South Asian cuisine where spices are added to melted ghee, butter or very hot oil. When the spice seeds are added to the hot oil, they sizzle and pop a little bringing out the spices intense flavour and aroma. 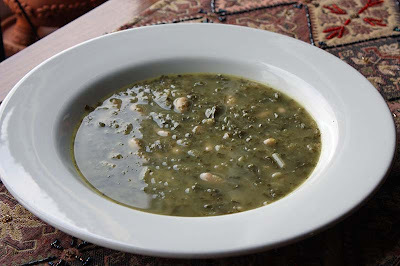 Tarka can be done either at the beginning of a recipe, and then the other ingredients are added to it; or it can be done after the dish is cooked. The Tarka - the intense flavoured oil along with the spices are poured over the dish and stirred well, which is the way I do it. 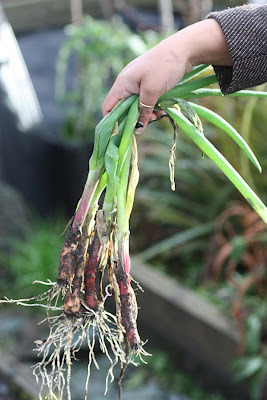 I had lifted these 'scarlet' spring onions from the plot early in the week. I had somehow mistakenly planted them amongst the leeks. Well you can understand why, they are thin and long like the leek. Spring onions are also known a scallion, salad onion or green onion and are related to the Allium family, the others are garlic, leeks, shallots and chives. The top green part is hollow and the bottom small root bulb. Spring onions are milder than most onions and can used raw, as a part of salads or cooked. One of the great things about the spring onion is that it is available all year round, its not one of those vegetables that has a specific season, however saying that the youngest and most tender are found in the spring and early summer. Spring onions are also a good source of vitamins B and C, fibre and folate. 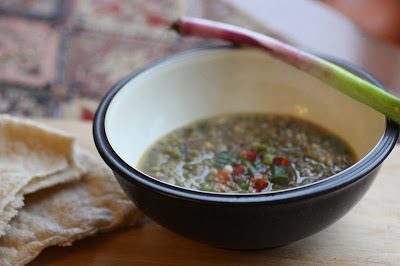 In this recipe for tarka mung bean dal, for a change I am using spring onions in place of small white onions. Just in case your wondering, the scarlet spring onions don't taste any different to the plain white versions, they just look a bit more fancier. 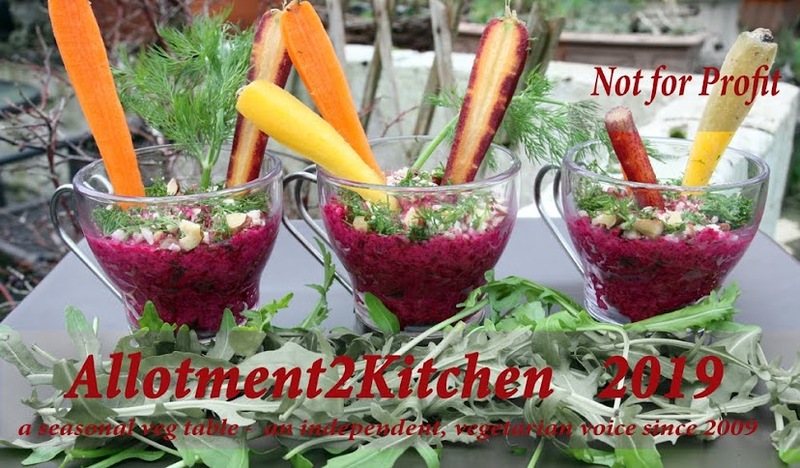 I am submitting this recipe to Laurie from Mediterranean Cooking in Alaska who is hosting this weeks Weekend Herb Blogging#213. WHB is a weekly food blog event showcases information and recipes about herbs, vegetables, fruits and other plant ingredients. WHB was initiated 4 years ago by Kalyn's Kitchen, it is now organized by Haalo of Cook (Almost) Anything At Least Once. 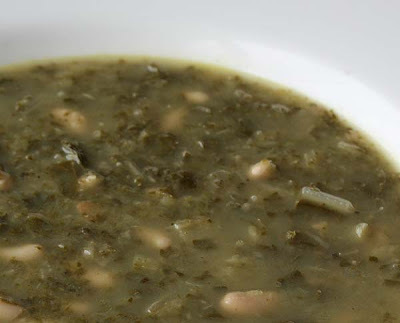 Put the mung beans and stock into a large pot and bring to a boil over medium heat. Then turn down to a simmer so that it just bubbles, until the beans are cooked. This should take about 40 minutes. Put the butter or oil in a frying pan and heat, until hot. Add garlic, ginger and white parts of spring onions, stir constantly until golden and slightly crisp, then add in the cumin and chillies until fragrant, then add in the greens of the spring onion and cook gently for a couple of minutes. 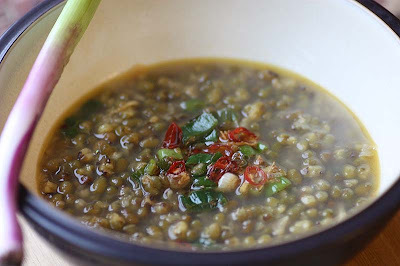 Add the tarka to the cooked mung beans, salt to taste, stir well and heat through before serving. Here are a few things dangling of my Christmas tree. 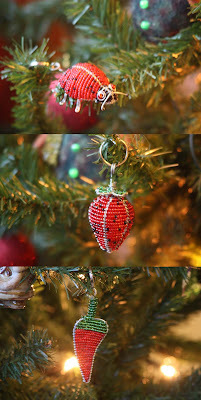 A ladybird, strawberry and a fiery chilli ornament, they are actually all key rings made by an organisation called Streetwires in South Africa. 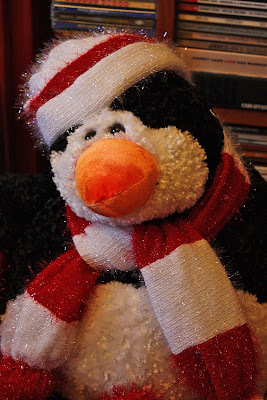 I got mine early in the year from a fairtrade event. I think they are quite versatile and suit the allotment to kitchen theme. A few good months ago, I came across these Scottish karaka blackberries at a grocery store and had to get them. It was madness and sheer indulgence especially as I had so many berries: raspberries, black and red currant, strawberries and gooseberries, all growing on my own plot, but when I saw these fat, long, juicy berries I just could not resist. Would you have been able to resist them? They actually tasted rather good and with substance and texture. We had eaten of these karaka blackberries with some fresh with whipped cream, some with waffles, some with pancakes, but I had some left over along with my own strawberries and raspberries. So I decided to preserve some of them in the form of jam. 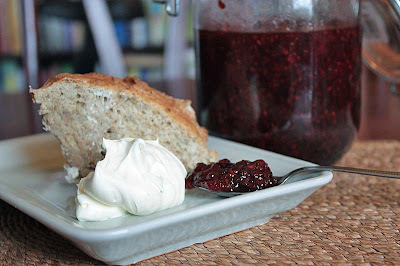 I measured out exactly 500g and made a simple 50:50 jam recipe from Darina Allen. We have pretty much finished the jar now, but I managed to take one picture before it was all gone. Here is the jar served with banana soda bread farls and whipped cream. 100ml milk (you may not need this). For two reasons, your banana might be really ripe and secondly, it depends on the consistency of the buttermilk or natural yogurt, some are thick and creamy, others are pourable consistency. So check after adding these, before adding any milk. Preheat oven gas mark 7. mix flours, salt, sugar, and bicarb in large bowl. Peel the bananas and mash to a pulp. Add the flour with the buttermilk, yogurt and enough milk to make a firm, but not dry dough. Knead lightly until smooth, then shape into 9inch round. Cut into six wedges. Transfer to a non-stick baking sheet and sprinkle with a little flour. Bake for 20 – 30 minutes until browned and crusty. Cool on a wire rack. Original recipe for Banana soda bread farls from here.